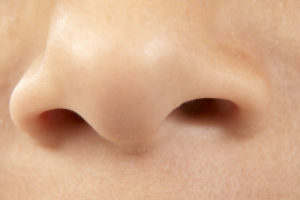 The perfect nasal septum divides the left and right nostrils evenly, but this is pretty rare; it’s estimated that about 80% of the population has a septum that is off center to some extent. Usually the deviation is slight and goes unnoticed; only the worst cases produce symptoms that affect breathing. Symptoms include nasal congestion (often limited to one side of the nose), frequent nosebleeds and sinus infections, facial pain and pressure, headaches, postnasal drip, and noisy breathing or snoring during sleep. If the deviated septum isn’t too severe, symptoms may respond to treatment with medications. Antihistamines, decongestants and nasal steroid sprays can reduce congestion and inflammation in some patients. When medicines are ineffective, a surgical procedure known as a septoplasty may be necessary to reposition a crooked septum and improve breathing. This involves removing excess bone or cartilage in order to create a larger breathing space, and is typically performed in an outpatient setting using local or general anesthesia. A rhinoplasty – surgery to reshape the nose – is often performed at the same time.